Tiffany Cherry is one of Australia’s most well known female Sports broadcasters. Currently presenting on Foxtel and Sky News Australia, Tiffany has spent fifteen years in the media industry building up her credentials and developing her written communication skills, interviewing techniques and reporting abilities to the highest of standards. Tiffany’s journalism career began in 1993 as a regular feature writer for “Australian Runner Magazine”. It was in 1997, when Tiffany landed her first role on television as a reporter for Channel Seven’s “Talking Footy” and during that time she also worked as a football reporter for 3AW; and subsequently over the next three years as a writer for “The Age” and “Herald Sun” in Melbourne; reporter for Channel Ten’s “Sports Tonight” and the “Ten Nightly News” in Sydney; “Seven News” in Melbourne and “CNN World Report” based out of Atlanta, USA. In 2001 Tiffany was one of the first employed at “Fox Footy” and was with the channel for the next five years. She was the first female AFL Boundary Rider and worked around Australia for the “Fox Footy” coverage. Tiffany was also the News Presenter on “White Line Fever” with Clinton Grybus and produced and presented her own weekly segment on injuries in the game, called “AFL Injury Update”. In 2004, Tiffany realised her passion for documentary making, producing an award winning special on AFL Football in the USA and thus far she has produced seven documentaries around the world including the USA, Europe, Africa, and of course Australia. In May 2007, Tiffany was chosen by the Nine Network to be the sports presenter on Mick Molloy’s new national comedy show, “The Nation”. In addition, Tiffany produced and launched her own radio talkback show “The Hen House” on SEN1116, which she co-hosted with Olympic Swimming champion, Giaan Rooney and World Champion netballer, Eloise Southby-Halbish. 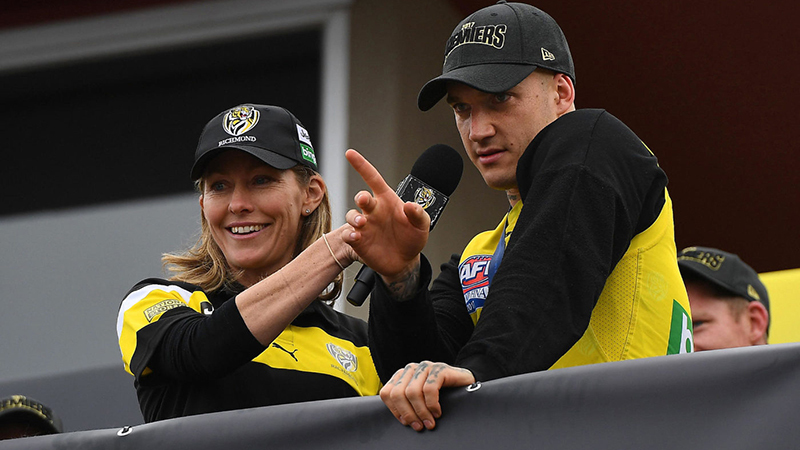 Tiffany also joined the talkback sports station’s AFL Broadcast team as Boundary Rider for their coveted Friday night games. 2008 saw Tiffany relocate to the USA and work with ESPN where she covered the NFL, NBA finals, Wimbledon, Australian Open, ESPY awards (sport’s equivalent of the academy awards), the AFL and NRL Grand Finals, the “Layne Beachley Surf Classic”, “Volvo Around the World Ocean” race and the PGA Tour. Tiffany has also reported on the Kentucky Derby, National Hockey League, Major League Baseball, English Premier League, Indian Premier League and 2008 Beijing Olympics – one of six Olympic Games she has both attended and reported from. 2010 was a significant year for Tiffany as she moved back to Melbourne and re-joined Foxtel as co-presenter with Steve Liebmann for the Vancouver 2010 Winter Olympic Games as well as hosting the New Delhi 2010 Commonwealth Games. Tiffany is also in pre-production for her own television sports show, “Flash Footy”, for Foxsports. This weekly half hour Indigenous and Multi-cultural AFL show will be co-hosted by Tiffany alongside stars, Michael O’Loughlin, David Wirrpanda, Andrew McLeod and Kevin Sheedy. Whether as a sports broadcaster, MC, keynote speaker, or panel member – in front of the corporate world, schools and sporting clubs – Tiffany is a natural, engaging Master of Ceremonies, speaker and presenter who can’t help but impress.